There was a 4.4 earthquake around 4:15 a.m. and a 3.3 earthquake around 4:30 a.m. There were two other weaker aftershocks as well. A 4.4 magnitude earthquake was felt across East Tennessee and in to parts of Georgia and North Carolina on Wednesday morning, the United States Geological Survey said, followed by a 3.3 magnitude earthquake and two other aftershocks. 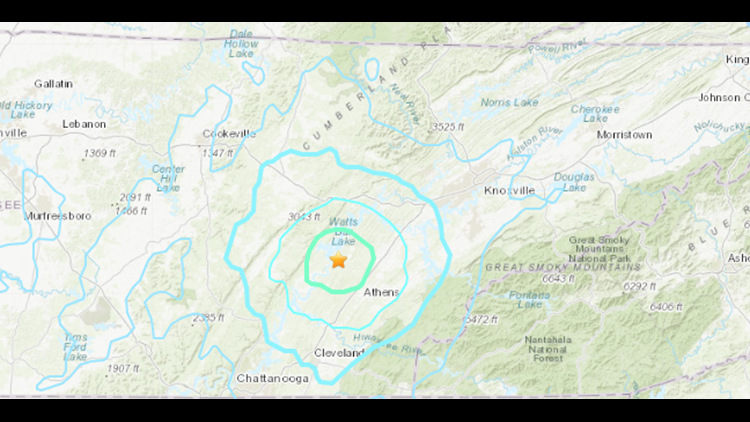 The earthquake happened around 4:15 a.m. and had a depth of about 9 kilometers with an epicenter several miles outside of Decatur, Tennessee, the USGS said on its website. It was the second strongest earthquake on record in East TN. The strongest was a 4.7 near Maryville in 1973, the USGS website said. The first aftershock was about 15 minutes later, with an epicenter in the same location. It was a 3.3 magnitude quake and had a depth of about 6.8 kilometers, USGS said. The second aftershock was 30 minutes or so after the first, with a 1.3 magnitude and depth of 5 kilometers, while the third, a 1.4 magnitude, was a little bit before 5:45 a.m. and also 5 kilometers in depth, according to USGS. There were no immediate reports of injuries or damage from the quake or its aftershocks, but a lot of people felt it. Dispatchers said some people reported their beds were shaking or that pictures fell off the walls. It did not damage any Tennessee Valley Authority facilities, TVA said in a tweet, including the Watts Bar Nuclear Plant, which is located near the two epicenters. TVA emphasized that its facilities are built to withstand earthquakes and they were not impacted. However, workers are conducting inspections just to be safe. 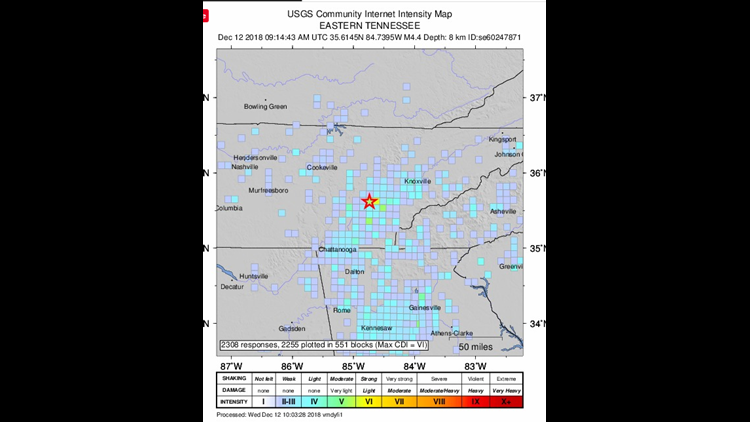 People from across Tennessee, North Carolina and Georgia reported feeling the earthquake, according to USGS, with a 'V' level of intensity on its ShakeMap and a 'VI' level of intensity on its 'Did You Feel It?' page, a community internet intensity map on USGS's website. 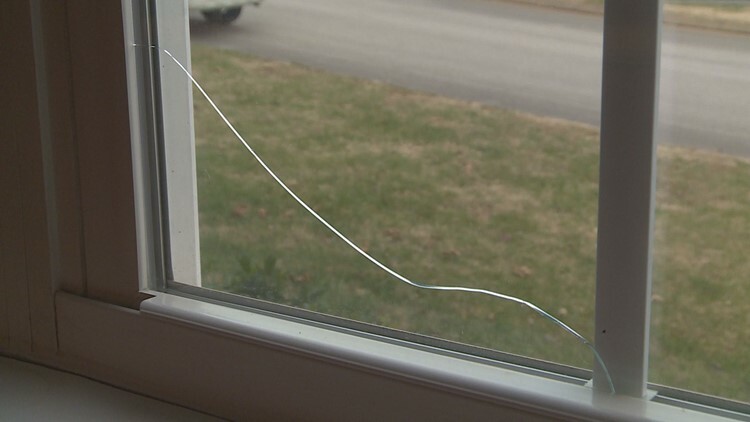 Holly and Jason Roe of Maryville noticed their window was cracked after Wednesday morning's 4.4 earthquake. Near the epicenter in Meigs County, Sarah Prichett thought a car had run into her house. "It was scary. I mean it was really scary. A few things in the house had fell off of shelves and broke," she said. Her dogs woke up too. "They were just going in circles. They didn't know what was going on," she said. Holly and Jason Roe woke up immediately to rattling and a shake in Maryville. "We both said at the same time, 'Earthquake,'" Holly Roe said. She looked on social media and learned it was a 4.4. She read that it could break windows. "So I thought I should just check that, and sure enough, I came in the bedroom and I looked at my window and it was indeed cracked," Roe said. The Roes have earthquake insurance but they said they won't use it for this window. They thought it was a good idea to get when there was a series of booms in Maryville this fall. "We live on a fault line so it's probably a good idea," Roe said. Many were reacting on social media too, with hundreds of comments within minutes on the WBIR post below. Want to report if you felt it or not to USGS? Click here for the first earthquake and here for the second. This is a developing story. 10News will continue to update this story as we receive new information.